Over 250 Pages of Complete Magnet Therapy Science! LEARN the proper scientific placement for Biomagnetic usage. UNDERSTAND which poles are used and why. 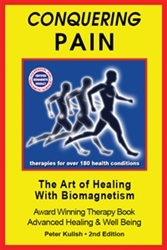 KNOW why using bi-polar or positive Biomagnets could be playing with fire. LEARN the importance of energized structured water. LEARN and use special techniques for energizing the body so that it will heal itself more rapidly. LEARN protocols to help heal disease, nerve, neurological, and genetic related issues.